This is the age of social media, not only the celebrities buy people love to have a social meddia account. 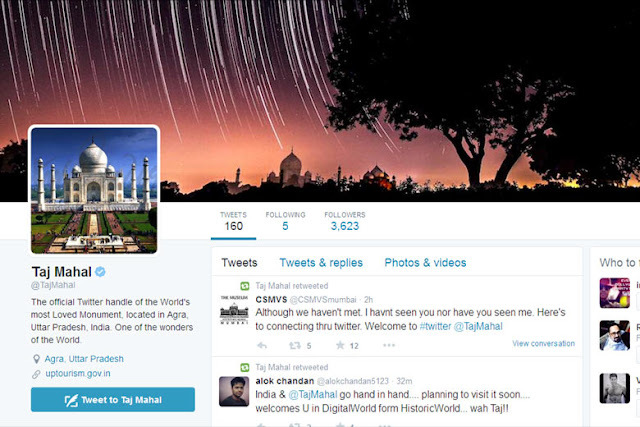 In this regard the monument of love i.e Taj Mahal also got it's first twitter account. With the launch of Taj Mahal’s twitter account today, the 17th century mausoleum became the “first historical monument” to have an official handle on the micro-blogging site. Uttar Pradesh Chief Minister Akhilesh Yadav launched the official twitter account of the monument– @Taj Mahal at his residence. “With this Taj Mahal has become the first historical monument in the world to have its own twitter account,” Principal Secretary Navneet Sehgal told local daily.. He said that while visiting the official account, a tourist could share his picture on #MyTajMemory, which would be included in the main account. In fact immediately after its launch the twitteraties started hash tagging pictures of their visit to the monument of love. Within an hour of its launch, the Taj Mahal account got more than 2000 followers. “There are two kinds of ppl in the world. Those who have visited me and follow me here and those who haven’t seen me and yet follow me here,” the official handle tweeted after its launch. According to sources, initially, it was proposed to launch the handle from Taj Mahal itself, but Archaeological Survey of India (ASI) denied permission. The twitteraties loved this step taken by local government and want to have other historical monuments' twitter handle as well. So that they can share their memories.